Preparation Methods & Dosage : The entire plant is used, roots, stems, fruit and leaves, but the resinous root is the part used most often in herbal medicine. The fresh bruised, or dried roots can be taken as a decoction, are made into extracts, and are the source of the essential oil. A magnificent plant to grace your garden, the hollow stems can be candied as well. Angelica tea is warming to the soul and body bitter but not unpalatable.. Angelica essential oil is used in aromatherapy. Also available as an extract. 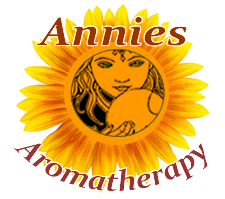 Angelica oil is herbaceous,woody, sweet and earthy. In the Kitchen: Young succulent stems and leaves can be eaten in salads, roasted or made into tea. They are also used for making candied angelica. Angelica seeds can be used for flavoring..
Angelica Side Effects: Because of its coumarin content, it may interfere with anticoagulant drugs. 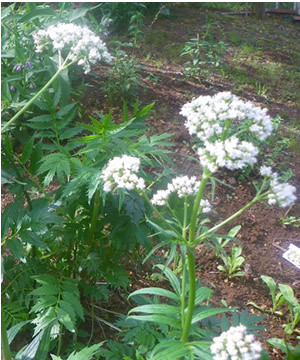 Angelica is a strong emmenagogue (a substance that induces menstruation) and should not be taken by pregnant women. Stem:Angelica has a strong and stately presence, growing up to 6 feet tall, fluted stems. 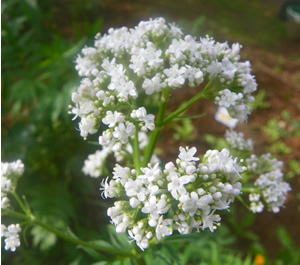 Angelica is unique amongst the Umbelliferae for its pervading aromatic odor. Distribution:Native to the Middle East, found worldwide in temperate zones. Related Species The Chinese species, dong quai, Angelica sinensis is widely used for womens health concerns. The North American native species -Angelica atropupurea has purple stems that set it apart from other angelicas, and contains many of the same active constiuents and uses in herbal medicine. However the plant grows in the same types of damp locations as poison hemlocks and is very similar in appearance to water hemlock - do not wildcraft unless your a supremely sure of the plant identification.